Make sure your dog always has a comfortable place to rest their head with dog beds, mats, and bedding from Dunwishin Enterprises LLC in Gaffney, South Carolina. Our inventory contains a selection of durable Pipe Dreams PVC dog beds and the highest quality crate pads and floor mats. Browse our online store to see the complete inventory of pet products we have for sale. We offer Flat Rate Shipping $8.95 for (Excluding Alaska, Hawaii, Canada and other foreign locations). 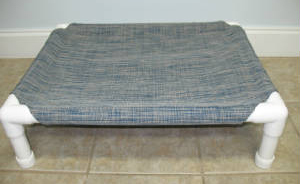 The PVC dog beds from Pipe Dreams keep pets suspended comfortably on fabric above uncomfortable surfaces, like hard floors and the ground outside. These beds offer support for your furry friend, especially arthritic, geriatric, and post-surgical dogs. The sturdy frame is assembled from easy-clean, furniture-grade PVC and is covered in poly-coated nylon. Both the fabric and pipe have UV protection, so the sun will not damage or destroy the pipefitting or fabric of your new beds. The fabric comes in assorted patterns and colors, and you can wash it easily with a hose and a brush. Pipe Dreams beds measure approximately 8" high, except for the 12" x 18" beds that measure 4 1/2" off the ground. Assembly is required, though no glue or tools are needed. If ever needed, We also sell replacement covers and parts. Replacement Covers for Pipe Dreams PVC beds come in assorted colors. The replacement covers are the same material as the original cover that comes with the bed. 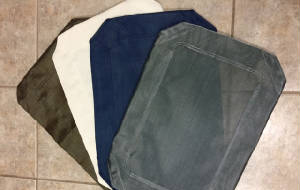 The fleece covers, made from the same high-quality fleece used for our crate pads, fit over the original cover to provide a soft area for your dog to lie. These covers are machine-washable and dry quickly. 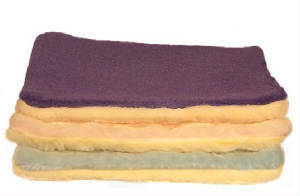 Manufactured in the USA, our crate pads are made with the highest quality fleece available. 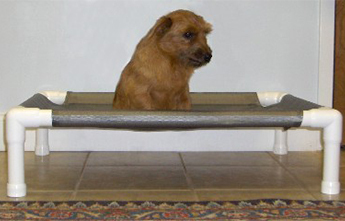 We suggest that you measure your dog while he or she is laying down to get the most accurate size pad for your dog. If you are using for a crate mat, please measure width and depth of the crate. These fine fleece pads are made for standard-sized crates, but custom sizes are available upon request. There are several options to choose from when purchasing dog crate pads. The Magic Carpet is a single layer of fleece that we cut to size. The Spoiler is a double layer of fleece sewn to size. The Faux Fur Spoiler has faux fur on one side and fleece on the other. Stop your dog from tracking dirt into the house with our reinforced nylon ground covers. The covers are perfect for placing on your patio or under exercise pens to eliminate mess and prevent surface damage. This material has UV protection in the fabric so the sun will not damage or destroy it, unlike the foreign-made mats. Custom sizes are available upon request. For a tote bag that matches your ground cover, add $10 to price below.